Think your 4K laptop or 5K iMac is hot stuff? If specification developers have their way, both will soon be old hat. 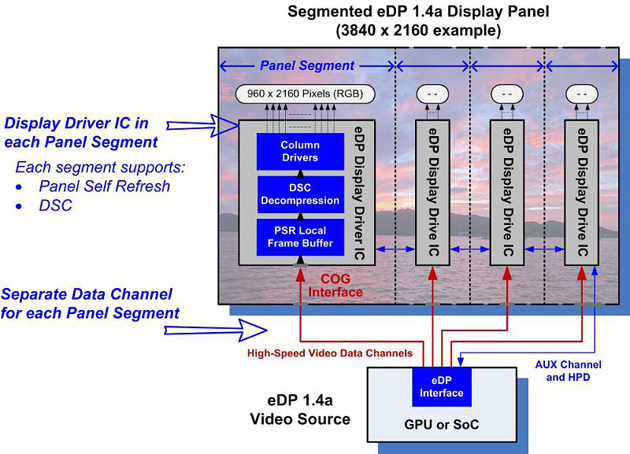 The Video Electronics Standards Association has unveiled Embedded DisplayPort 1.4a, a new format that lets all-in-ones and laptops use 8K screens (7,680 x 4,320, if you want to be exact). The technology uses compression to squeeze more data into the video feed, and it can divide displays into two or four segments to help the pipeline cope with all those extra pixels. There should be advantages to 1.4a even if you don't crave razor-sharp visuals. Since PC makers won't need as many data paths to drive lower resolutions, they can use thinner and more efficient displays. A laptop that "only" supports 4K could have longer battery life, for instance. The best part is that this is more than a theoretical exercise -- VESA expects systems to ship with the new DisplayPort by 2016. You might not see an 8K computer all that quickly given that this capability hasn't even reached shipping TVs, but the groundwork will at least be in place.